You probably have a dream car. Maybe it's even relatively practical. Whatever it is, you are dead-set on having it one day and you are gonna keep it for life and wax it with a baby diaper (Ferris Bueller reference). Let's say it's the newest Corvette. One day, your wife pulls up in the driveway in something else. It's a brand new Ford Fusion. This is the car you will drive everyday for the rest of your life. You are overjoyed! What an incredible surprise! You are overwhelmed by her thoughtfulness, and the car really is not only beautiful, but practical. It was an incredibly sweet thing for her to do and you love her even more for it. ... but you wouldn't have chosen that car. You are not ungrateful in the slightest, but you quietly wish that she had taken your preferences into account. The surprise was stellar! But part of you feels a little sour that this is the car you have to drive for the rest of your life and it's not really your style. Of course you will graciously accept it, and you can't wait to take her on a trip with it... but having your Corvette would have made that thought complete. It's totally fine though, and you love it nonetheless because it's from your adoring, beautiful wife. Now put that scenario into an engagement ring scenario. I am not saying all women are shallow about engagement rings. We really aren't. But there is no denying that some may dream about them and pick the kinds they hope to have someday. Like any person, we might even get our heart set on one. Here are some photos of what Tom proposed to me with (left) and what he actually had for me (right). We didn't go ring shopping together. We hardly even talked about rings at all....or engagement for that matter. I simply made a couple of hints towards what I did not like (the cut of the ring on the left I had made very clear was not my taste) and a couple of hints of what I did like. 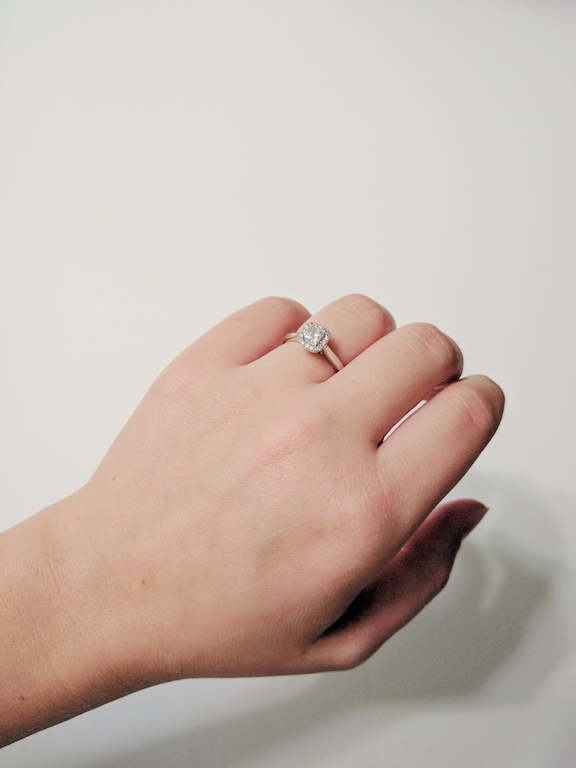 I never showed him pictures of my dream ring, and when he proposed, it blew me out of the water. It was a complete surprise. Had I gone ring shopping with him, I would have gotten my heart set on something, and then been disappointed if that's not what I saw when I opened the box. But that's just me. I fully trusted him to get me the right style... until I opened the box and saw that first ring. "Did he not have enough money? Did I push him to do this sooner than he was ready? Wasn't he listening when I said I didn't like this cut? In what world would I EVER say no? This doesn't matter. I LOVE HIM. There is no way I could ever say no... but how does he not realize that I would hate this ring? This is sooo not like him.. he knows me better than this! Oh nooo we don't have to get engaged now if you aren't ready, love!" He watched me, knowing so clearly that this was the absolute wrong ring for me. He just haaaddddd to test me! Of course I would say yes. I knew it was just a ring. I loved him more than any silly old ring. He looked at me and asked "Do you love it?" and I peeped out a lie, "Yeah, yeahhhh... I love it!" Suddenly he dug into his shirt pocket and pulled out the other sparkler. "Well then what am I going to do with THIS??" He DID listen! It was the exact ring I had my heart set on and I never even showed him a picture. He just knew me well enough and picked up on my hints enough to figure out what I liked. The first ring was a $10 fake from K-Mart - haha! Like the car scenario, it wasn't at all about being ungrateful or not overjoyed. If you really love this person, feelings of happiness and excitement are most certainly going to trump any disappointment you might have in their ring choice. leaving this all up to interpretation is going to lead to a ring you probably don't love. My advice? Pony up and say, "Hey, I'm not gonna push the subject any more then this, but can I just show you what ring I like? (Just a picture... no need to find the nearest store) I'd prefer you wouldn't guess or think you know what I like and then it's not. It's a big purchase and it would kinda stink for both of us if I didn't care for it, ya know?" By not making your preferences clear, he's left to interpret what he THINKS you like, which may not be accurate. In that case, sorry, but it's not his fault if you don't like it. listen to her. If you want to propose and she hasn't broken the ice on the subject, maybe she's waiting for you to ask. You don't have take her into the store with you (plus, there's no surprise in that), but ask her for some pointers and note them! Also, if you have the assumption that all "good" rings cost upwards of $20,000, think again. Below is a Tiffany and Co. engagement ring. Tiffany's is all crazy overpriced, right? How much would you guess it costs? At LEAST $10,000, right? It's $2,950. Less than you thought, huh? Don't be afraid of ring shopping, guys. It's pretty painless. And if she shows you a picture of a ring, she may be giving you hours of breakdown in precisely what she wants. Don't treat it like a "guide." Take me as an example: I did NOT want diamonds down the band, but I did want a halo. Almost all rings with halos have diamonds down the band. How Tom knew exactly what I wanted is a mystery to me, but I am not complaining. All I'm trying to say is that this woman has to wear this ring for the rest of her life. If you had to drive one car for the rest of your life, you would certainly want it to be "you," so keep the same in mind when getting her an engagement ring. You wouldn't want her to spend thousands on that car you didn't like, would you? Same is true in the ring department. Who knows, maybe she would have even preferred something CHEAPER and there you are with a hefty bill and a girl that's a tad disappointed. Learn what she really wants, that's all I'm saying! Please don't mistake this post for being materialistic or shallow. It's just something that Tom and I have talked about (I even gave him the car scenario before we got engaged and it kind of clicked for him) and I wondered if other couples have had the same scenario cross their minds. I would have married Tom if he had given me a rubber band. It's the marriage that's important, not the ring... but I'll tell you this, I STILL thank him regularly for giving me the ring I wanted. I never look at it and wish it was different.